Ideas don’t sell themselves. As the forces of globalization, automation, and artificial intelligence combine to disrupt every field, having a good idea isn’t good enough. 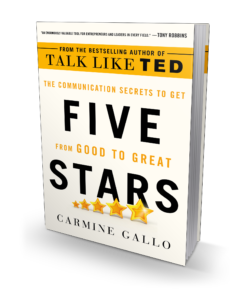 In FIVE STARS: The Communication Secrets to Get from Good to Great bestselling author of Talk like Ted, Carmine Gallo argues that mastering Aristotle’s “ancient art of persuasion”—combining words and ideas to move people to action—is the key to standing out and getting ahead in the age of AI. According to a recent survey, 94 percent of hiring managers say an employee with stronger communication skills has a better chance of being promoted to a leadership position than an employee with more years of experience but weaker verbal skills. FIVE STARS is the guide to gaining a human competitive advantage in the knowledge economy.